Connemara cottage, four hundred yards off the coast road, 10 km from Roundstone and 4 km from Ballyconneely. Emlaghmore Cottage was built in stone in about 1905, with just three rooms, and was extended in the 1960s to make a holiday home for a family. It stands on about ¾ acre running down to Maumeen lake, and is about 400 yards off the coast road (The Wild Atlantic Way) in a secluded situation with fine views. It has a shed with a supply of turf for the open fire in the living room, and garden furniture. There is a boat for anglers on the lake. There are night storage heaters and electric radiators, TV &DVD player. The kitchen/dining area has bottle gas cooker, microwave, fridge-freezer and dishwasher, and is fully equipped with food processor and utensils, including a pot big enough to cook the lobsters, and a larder with wine rack. The utility room has a washing machine and tumble drier. There is a store, with a cot, high chair, and a collection of wellingtons, life jackets, body boards, buckets and spades, and some games in case of bad weather. We supply bed linen, duvets and bath towels. Please bring your own for sea bathing. You are charged for electricity at cost price. The nearest safe, sandy beach is about a mile, and there are many others for surfing or windsurfing. You can ride horses or bikes, go fishing on lake or sea, play golf on Ballyconneely links course, climb mountains, visit Kylemore Abbey, the National Park or the Marconi and Alcock and Brown site, or sail to Inishbofin or the Aran Islands. 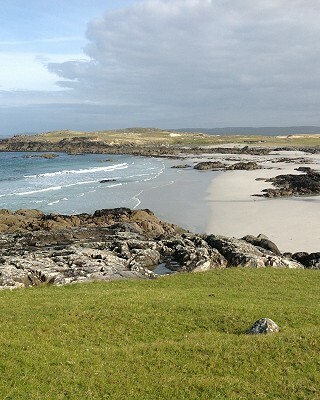 Clifden with its Pony Show is 8 miles and Roundstone, a pretty fishing village, is just six miles. There are good pubs and some excellent restaurants. Your dogs are welcome as long as they are house trained and OK with sheep.